Oh, it was everywhere this Christmas. Everyone caught it. You couldn’t avoid it. You’d stand next to someone who had it, trying to resist the urge to follow suit. But this virus is catching – and it’s set to go viral. Like all good illnesses, it has a silly name mindlessly accepted by the general public. ‘Martin won’t be able to attend the budget meeting today, he’s got The Flu. Honestly – snot everywhere.’ Last time I checked, The Flu had joined U2 and Snot was a new character on CBeebies. All Martin needs is a lie down with a good book. All 200,000 of them. Someone get this man a Lemsip and an Amazon voucher – he’s got Kindle-itis! Martin is, as it were, just another book in the library. Everyone’s getting a Kindle nowadays – from your dad to your dog (though Kindle rumoured to soon replace pets). What once was viewed on the tube with distressed whispers (‘what is that thing?’) is slowly becoming the ultimate name drop (‘You’re not coming in’ ‘But I’m with Kindle!’ ‘Come in!’). 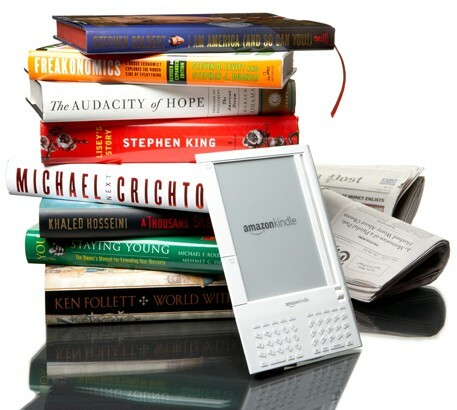 For the 1% of you not in the know, the Kindle is an e-book reader which enables users to shop for, download, browse, and read e-books, newspapers, magazines, blogs, and other digital media via wireless connectivity (thanks again, Wikipedia). With all this at your fingertips, trips to your local library will become a thing of the past (come to think of it, did David Cameron invent the Kindle?). Waterstones will act as a museum for children of the Noughties; the only shop the London looters avoided. To quote an employee, ‘We’re staying open. If they steal some books they might learn something’ (to be fair on the looters, they may have been waiting for the aptly-named Kindle Fire to come out in September). But is Kindle-itis empowering, or does it produce bizarre symptoms? When my cousin whipped her Kindle out on the beach, I didn’t know where to look. The juxtaposition of nature and technology made me feel uneasy. When it comes to the sun and sand, you’ve got to expose your back: hard, paper or otherwise. Greediness is another symptom, verified by one man’s quip on the Tube. ‘There’s an advert for the Kindle. That one holds only 250,000 books. I saw one that holds three million – there’s a big difference!’ I doubt he’ll read more than 100 books in the next 20 years. And if the Kindle really does promote such improbable levels of reading, Martin may have to cancel every future social engagement, including his own funeral. “Books are no more threatened by Kindle than stairs by elevators”, says Stephen Fry. While most people are happy to squeeze into that lift, I still get greater satisfaction climbing those steps. A sprained ankle beats Kindle-itis any day, in my book.